When I saw that this CD was sent by Frank Grau (Species Being, Beyond-O-Matic) I imagined some kind of Krautrock or interesting avant-progressive rock disc. Well, I was partly right. I slip in the disc and the opening track, "Sleep Is Wrong", begins with heavy rocking intricate guitar and violin patterns (and some very strange voicings). Ah... heavy progressive rock played by solid musicians, I think to myself. This could be good. But then... the guitars start to pound out a metallic crash and death-metal vocals growl madly. What's going on here? And then they do another 360 degree turn and we're back to these avant-prog-ish patterns that remind me of RIO styled prog with Dagmar/Susanne Lewis vocals... and then back to the metal.... and then back to the... whewwww... what a roller coaster ride. Sounds crazy doesn't it? Well then I'll confuse you further by saying that this is both one of the best damn progressive rock album I've heard in 2001, and certainly one of the better all-around hard rock album I've heard in years. Yesiree! Sleepytime Gorilla Museum are from California and consist of Nils Frykdahl on guitars and vocals, Dan Rathbun on bass and vocals, Carla Kihlstedt on electric violin and vocals, Moe! Staiano on percussion, Dave Shamrock on drums, and Frank Grau (Species Being) on drums on one track (though he's since replaced Shamrock as full time drummer). The Gorillas return to the intense growling metal thing at various points on the album, but throughout the disc you'll also hear some mightily impressive hard rock and avant-prog/RIO structures. "Ambugaton" is a standout track on which the Gorillas kick out some killer heavy, but intricately structured, progressive rock. Early in the tune Henry Cow comes to mind but later on it starts to rock hard and we're into Thinking Plague and 5UU's territory, though the Gorilla's are far more aggressive than any of those bands. "Powerless" is a similarly heavy tune. I love the off-kilter and continually shifting rhythms and crazed male/female vocal harmonies. The manic screaming alongside Carla's vocals gives a sense of beauty to the insanity. "Ablutions" features dark and scary music that mixes Present with Devil Doll, and Carla even does the "Dagmar Krause doing Mr Doctor" thing to make the whole proceedings gorgeously demented. Actually the orchestration of Devil Doll is a good analogy though the music really leans more toward the Present/Univers Zero realm. "The Stain" is another enjoyable track, mostly because it includes some of the deepest darkest bass I've ever heard. The theatrical RIO'ish vocals are present but the guitar/bass duels have a King Crimson feel to them. "Sleepytime" is the one track that dragged a bit for this listener. It develops very slowly, starting as a child-like, but deranged nighty-nite song, eventually evolving into a full blown metallic rock orchestra. A powerful tune but it has slow spots and would have been stronger had it been edited down to about 5 minutes (from ten). Finally there's "Sunflower"... Ummmm... well... my nerves are so frayed from 50 minutes of pure aggression that 8 minutes of peaceful Japanese koto sounding music is just not going to calm me down. I'm still PEAKING!! I'm giving this one back to the Gorillas. In summary, this sucker ROCKS! I'm filing it with my Thinking Plague and 5UU's discs, all among the best rockin avant-prog of the 90's and new millennium. Top-notch musicianship and a creative mixture of styles that I never would have imagined would go together so well. It ain't space rock or psychedelia dear readers, but this disc is waaaaaaay out there. Highest recommendation. 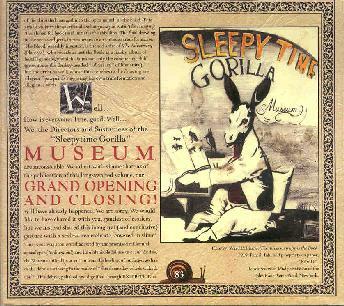 For more information you can visit the Sleepytime Gorilla Museum web site at: http://www.sleepytimegorillamuseum.com/. Contact via snail mail c/o Chaosophy Records; 915 Cole St; PMB 307; San Francisco, CA 94117.